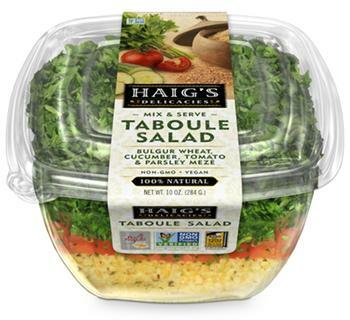 Haig’s Delicacies of Hayward, Calif., is recalling 342 cases of Taboule Salad that may be contaminated with Escherichia coli O157:H7 bacteria (E. Coli O157:H7). The recalled product is packaged in a 10-oz. plastic tub with UPC 7-08756-77055-9, as well as a 3-unit multi pack with UPC 7-08756-37055-1 and a 6-lb. bulk foodservice bag with UPC 7-08756-77077-1. The affected lot is 17298 with an expiration date of 11/16/17, and was sold in retail stores in California. Customers who purchased the recalled product should not consume it, but return it to the place of purchase for a full refund. Consumers with questions may contact the company at 1-510-782-6285 M-F 7:00am to 3:30pm.